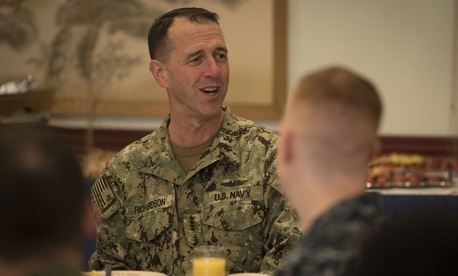 The U.S. Navy, which is graduating 40,000 trained recruits every year, “is the most talented Navy we have on record,” Chief of Naval Operations Adm. John Richardson said on Monday. The service has met its recruiting goals for sailors every month for the past 12 years, he told an audience at the Brookings Institution in Washington, “even though we can’t compete” with the private sector on salary. And the Navy “demands a lot,” Richardson added, citing requirements that recruits spend seven months at sea away from their families. “The players change, the rules changed” in the past two years, Richardson said of the priority check executing the Navy’s role in a world in which technological change continues to accelerate and, over the past 25 years, maritime traffic has quadrupled and global gross domestic product doubled. The new strategy addresses a “the spectrum of rivalry” ranging from a low-end “gray zone” of information warfare to a high end of violent non-state conflict and total war. Richardson stressed the needs to enter situations with greater agility, sustainability and the ability to “deescalate on our terms,” he said. Getting technology quickly to the field is the “Achilles Heel” of the Navy’s approach, Richardson said. An example of the lack of flexibility is the continued stationing of ballistic missile defense vessels on land. “We need to build” such facilities on land so we can “liberate” those ships, he said. An example of new geographic agility is the Navy’s recent return to the Arctic—the first time since 1991. It required “getting out the old books,” and details such as the procurement of Louisville Slugger baseball bats for use in striking down ice, he said. The design’s “core attributes” include, in no set order, strengthening naval power at and from sea; achieving high-velocity outcomes; strengthening the U.S. Navy team and “expanding our network of partners” (which include Marines, other military services, interagency representatives, Congress, industry, academia and international laboratories). “How we bring in people, pay and assign them” is now getting extra attention to “bring us out of the industrial age” to create “a 21st century personnel management system,” Richardson said. Invoking the famed Rear Admiral and computer scientist Grace Hopper, he confessed that the Navy has been using 57 different databases for human resources planning—“we still have databases from when Hopper worked in the 1950s,” he said. Instead, the new Navy will move employee benefits data to the cloud, so that sailors can access them with a smart device, he said. Asked about the Navy’s role in handling frictions between the United States and China, Richardson said he had hosted his Chinese Navy counterparts stateside, and, just this month, completed “a rich visit” to China itself. “I don’t think there’s any question we’re in competition with China,” he said. The two nations have “common interests,” for example, on the Korean peninsula, but are “at odds right now” on the “code of behavior” for ships passing in the South China Sea. Both the United States and China were clear on these points at their recent meetings, he said. “We’ve got to minimize the risks” of a flare-up.